French-Canadian actor Alex Gaumond (33) has announced that he will join the West End cast of We Will Rock You from August 8th. 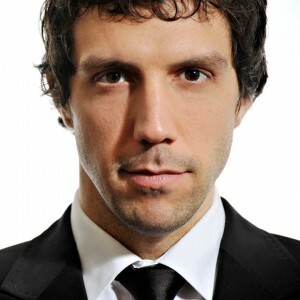 He will be taking over as ‘Galileo’ from Ricardo Afonso at the Dominion Theatre. This is not a new role for Alex – he played Galileo in the original UK tour for seven months back in 2009 before being cast as ‘Emmett Forrest’ in ‘Legally Blonde The Musical’, a role which has won him two nominations for ‘Best Actor in a Musical’ in 2011 (Whatsonstage.com Theatregoers’ Choice and Olivier Awards). Alex has been in the UK since 1997. He graduated from Guildford School of Acting with a 1st Class BA (Hons) in 2000. Immediately after graduating he made his professional acting debut understudying the role of Chris in ‘Miss Saigon’ (Philippines production and Asian tour), followed by his West End debut understudying three leading roles in ‘The Full Monty’. After roles in several other West End productions and UK national tours, audiences of ‘We Will Rock You’ saw him performing the lead role at the Palace Theatre Manchester, the Sunderland Empire, the Birmingham Hippodrome and the Bristol Hippodrome. Alex is a very versatile actor and musician. I have seen him in ‘Legally Blonde’ seven times and he gave a wonderful and touching performance each time. He made the role of ‘Emmett Forest’ his own, playing the charming young attorney with heart and passion. I also went to his gig at the Leicester Square Theatre in May 2011 so can say that Alex is a great musician and entertainer. It was a fantastic concert and Alex performed brilliantly – on his own and as part of duets with fellow musical stars Ramin Karimloo (Love Never Dies) and Sarah French (We Will Rock You). He also sang two songs that he wrote himself to an audience that clearly loved him. Doubtless Alex will shine as Galileo at the Dominion Theatre in the West End (review to follow!) . I recently asked Alex a few questions that he was kind enough to answer. It’s a great interview, enjoy! I didn’t have plans of working in this industry until quite late. I had been playing piano since the age of 6 and singing since the age of about 12, but only as a hobby. In my late teens I was doing business studies back in Quebec, whilst performing in musicals, again as a hobby. Although I was loving it, Musical Theatre isn’t a very big part of our culture in Quebec, so to have a career in acting and singing wasn’t even something that came into my head. Then, when I was 18, my father got an opportunity to come and work in the UK, so since we were going to move here I tried my luck applying to drama schools as I figured it was probably the best place to train in the world. I was very fortunate to get a place at Guildford School of Acting, and suddenly my fate was completely turned around and I had very exciting plans of making a career out of what I loved doing. I was very fortunate to have musicians in my family, so I guess they inspired me the most. My aunt and uncle owned a music school for a while, so I had piano and band lessons, and another of my aunts was a very well established singing teacher and I went to her for singing lessons, so I was able to develop the music side of things quite early on. Then, at college one my best friends convinced me to audition for a musical they were doing and I got in, so that’s how I ended up doing musicals as a hobby, before moving to the UK to train at Guildford School of Acting (see above). In terms of performers, as my knowledge was pretty limited, the only one performer that inspired me from an early age before I trained as an actor was Bruno Pelletier, a French Canadian singer who ended up doing musicals, notably Notre Dame de Paris – he actually came to the West End with that show. You are from Canada. What made you come to the UK…and stay? I came here with my family (see 1st question) and even though they went back to Canada after two years, I had to stay to finish my course at Guildford School of Acting. After that I stayed here initially because of work, but now I have grown very fond of London and I have no plans of leaving anytime soon. It’s a beautiful and vibrant city with so much to offer, and one of the best places on Earth to live. The UK has been my home for 14 years now and I love it here. I would love to work with any of the Hollywood greats, whether on stage or film. The best part of being an actor is the fact that you are essentially a chameleon. With each new job comes a completely new character who is very different from the other characters you’ve played before, and you have to mould yourself into that character whether or not he resembles your own personality. I love the process of trying to be yourself within somebody who isn’t you, and to try to find the truth in everything you do, regardless of how extreme the circumstances of the play are or how different the character is to you. I suppose the hardest challenge of being an actor is what comes with any long-running show – repetition. When you play the same role for a very long time, you are essentially saying the same words every night so the challenge is to keep scenes fresh and true for each audience who are seeing the show for the first time. It takes a lot of discipline and dedication but it’s totally worth it. What parts would you really like to play? In terms of musicals, I’d love to play either Leo Frank in Parade, Judas in Jesus Christ Superstar, Chris in Miss Saigon, Joe Gillis in Sunset Boulevard or Stine in City of Angels. Sadly, none of these musicals are playing! Revivals anyone? Yes, I definitely aim to do an album in the next few years, hopefully sooner rather than later, but these things take time. I would also love to perform on Broadway at some point, and I have ambitions to do more films and maybe try to crack Hollywood, but that’s a lot more long term (there’s plenty of time for that, many film stars start very late!). I’m the kind of guy who is always thinking ahead, and always aiming high. Someone very close to me gave me a card once that said “Shoot for the Moon. Even if you miss you’re sure to land amongst the stars”. I’ve always liked that quote. What are your plans as a musician? Will there be an album someday? I have been to one of your gigs and have talked to people there who would all buy your album (including myself). See above. Nice to know there is demand for an album though, as it’s definitely coming! Have you got time for hobbies at all? Not sure I do actually, apart from going to the cinema which I love, but lately I haven’t had time to go as much as I would like. A bit too busy at the moment! Apart from going on holiday, if I was to stay home I would go to the cinema a lot, visit my friends who live outside London, go and see some theatre, try to get inspired to write some songs (oops, does that count as work?). You originated the role of ‘Emmett Forrest’ in the hit musical ‘Legally Blonde’ and completely made it your own – a very hard act to follow for future ‘Emmetts’! What would you say is the most important thing about Emmett and how you feel he should be portrayed? Of course there are many ways to play Emmett, but however you play him I think it is absolutely crucial to play him as truthfully as possible. For the musical to work we have to totally believe Emmett’s character and the connection he has with Elle. In the show he is very much the catalyst that drives Elle to turn her life around and succeed at Harvard, and the relationship they develop through the show has to be believable for the audience to connect with the story. In a show full of heightened energy and slightly larger-than-life characters, the audience needs Emmett to be the rock that grounds them to reality, which in turn becomes Elle’s rock that helps her block out distractions and realise her true potential. How did you keep the role fresh for yourself – after all you did 8 shows a week for about 1 ½ years. Did it ever get boring? It never got boring but doing a long run certainly comes with challenging periods when saying the same words every day gets more difficult. When I went through these patches, I had to do a kind of “system reboot” (pardon the computer analogy) when I reassessed my character, reminded myself about the audience seeing the show for the very first time, thought back to initial rehearsals and tried to really think about what the scenes needed from me for the story to work. During a long run, it’s fairly easy to start caving in on yourself and get stuck inside your own head, but when that happens I believe you have to give everything back to the story and commit to what the show and the audience need from you, rather than what you think you need for yourself. That seems to work for me. And of course from time to time, like in every job, a holiday will do wonders. What is your favourite LB song? I always have the same answer to that question. Although I really love “Chip On My Shoulder”, my favourite song is “Take It Like A Man” because that’s a real turning point in the story and the relationship between Elle and Emmett. The scene has some really nice moments where they start to get a glimpse of a genuine connection that leads to the real thing later on. It’s a very cleverly written song. You are about to play ‘Galileo’ in the popular musical ‘We Will Rock You’. This is not a new role for you – you played Galileo in the original UK tour for seven months back in 2009. How do you feel about returning to the same role – but this time in the West End? I can’t wait! I absolutely loved playing Galileo in the original UK tour and I really look forward to doing the show again at the Dominion Theatre. The stage is quite different (much bigger I believe, with lifts etc.) which is great as it won’t feel like doing the exact same production. Plus, I am older and wiser now, so I look forward to seeing how that will affect my interpretation of the role. Hopefully it will be for the better! Most of all, I cannot wait to sing all those Queen anthems again, that’s the best part of the job! How would you describe your character (Galileo)? In a nutshell, what is WWRY about, i.e. what message does it send out to the audience and why should everyone go and see it? WWRY is about real music, it’s about remembering how music makes you feel when it’s live. It’s a wild story set in the future with crazy characters and a lot of comedy. Most importantly it has all of Queen’s mega-hits backed up by a live band personally chosen by Brian May and Roger Taylor, and they sound incredible. It’s a show delivered every night with passion and gusto, and it will blow your ears off. Anyone who likes Queen music (and who doesn’t?) should see it. The show is in its 10th year now and recently won the 2011 Olivier Award for best long-running production, voted for by theatregoers, so if you have not seen it yet, now is the time to go. You come across as a very friendly person. You always talk to your fans at the stage door and are happy for them to have their photo taken with you. How important are your fans to you? The way I see it (especially in these difficult economic times) is if people spend their hard earned cash on seeing a show and they make the effort to come to stage door afterwards because they want to see me, unless I have something urgent to do I will happily spend some time with them. I come to work every day but they may see the show only once in their life, so if they would like to see me, spending a little bit of time with them is the least I can do. Same goes with photos. If it enhances their theatre experience and makes it that extra bit special, it makes me feel happy. Maybe it’s because I’m Canadian but generally in life, I just like to be nice to people. And anything else you might like to add? Maybe a message to your fans? I only joined Twitter and Facebook fairly recently, during my time at Legally Blonde, but very rapidly the fans have shown me a lot of support, so I would like to thank each and every one of you for being so great. Hopefully we will keep building our relationship together through WWRY and any other project I go on to after that. If you have photos with me at stage door (of any show), go to my Facebook page and post them on my wall, I’m slowly building quite a nice collection! Thank you very much for your time Alex and all the best for your new role as Galileo!